All Encino homes currently listed for sale in Encino as of 04/20/2019 are shown below. You can change the search criteria at any time by pressing the 'Change Search' button below. If you have any questions or you would like more information about any Encino homes for sale or other Encino real estate, please contact us and one of our knowledgeable Encino REALTORS® would be pleased to assist you. "Welcome to your dream home in the heart of Encino with over 14,000 sq. ft. of living space. Upon entry you will be greeted by high ceilings and a sweeping double staircase that highlight the meticulous craftsmanship and attention to detail that went in to this newly constructed home. This estate has eight total bedrooms and twelve bathrooms situated on an appx. 26,000 square foot lot. Main level has a home theater, sauna, indoor pool, wine cellar, office, maids quarters and two separate two car garages with direct entry. Second level features large master suite with dual walk-in closets and dual bathrooms along with 4 additional en-suite bedrooms, laundry and sitting area. 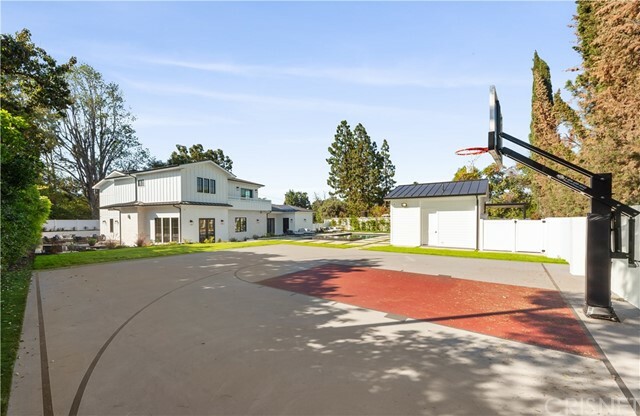 Grounds include a sports court, putting green, outdoor BBQ and sun drenched pool and a cabana that make this the ideal home for entertaining, true California indoor/outdoor living. The two story detached pool house has a full kitchen and living room, two bedrooms and two bathrooms. A truly spectacular must-see." "Red Door Homes, a luxury design/build firm introduces The Homestead, an acre parcel with a residence, complete one bedroom guest house, and private grounds designed to give homage to the lifestyle of a Napa Valley vintner. A long, gated drive reveals the main house where stone, steel, white oak paneling, European oak floors, and aged wood beams are amongst the fine finishes transforming this new construction into a bespoke custom home, juxtaposing organic beauty and refined finishes for the most discerning. The main floor offers a formal living room, formal dining room, great room with soaring high ceilings and a dramatic chandelier, center island kitchen and adjacent den, mudroom, library, huge home theatre and two en-suite bedrooms. Upstairs find four additional bedrooms including the master retreat and sitting room. Beautiful grounds include a large pool and infinity spa, outdoor kitchen, stone fireplace lounge, vineyard, raised planter vegetable gardens, and two, two car garages." "New Construction! This modern masterpiece has a large circular drive behind 125 feet of gated frontage. Dazzling city lights views abound from this bluffside home with a level of quality rarely achieved. The 2-story foyer has 3 foot square grey porcelain flooring, a floating steel and glass staircase and a backlit Onyx wine wall. The family room adjoins a stunning kitchen accented with an expansive island and Miele appliances. The main level also offers a state-of-the-art home theater with its own wet bar. Upstairs all bedrooms are ensuite with terraces and breathtaking views including two Master Suites. A custom onyx wall panel adorns the Master Suite along with 2 large walk-in closets with leather lined shelving. Fleetwood doors flow out to a 100 feet yard featuring lush lawn, an expansive infinity edge pool and a sunken fire pit . A 5-star resort cabana & outdoor kitchen are made for entertaining. Crestron Smart Home, a 4 car garage and large motor court round out the amenities." "Don t miss this rare opportunity to build your dream estate on the most prestigious street in Encino. This extremely rare FLAT 2.34+ Acre South of the Boulevard parcel is ready to be developed. Current design created by acclaimed Windsor Smith for a 17,000 sq. 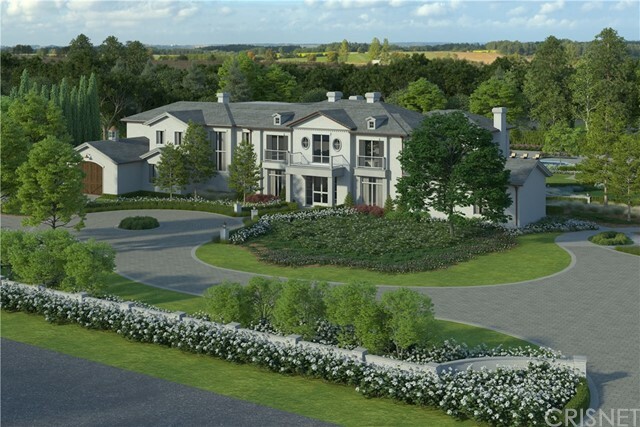 ft. estate was submitted for approval. This property would also be an amazing project for a builder/ developer to subdivide and develop into 2 5 homes. Act fast, as there is nothing on the market remotely similar to this property in Los Angeles." "OFFICIAL GRAND OPENING.Come experience the premium upgraded elevator to all levels of home.Brand new Architectural Contemporary with customized elevator and tennis court in Royal Oaks (south of the boulevard ) with over 10,000 square feet- including a theater, gym, and cabana plus 5 bedrooms on the same floor.On the first level,with a grand entry,are 2 rooms that can be used as an office and/ or bedroom for visitors.Beautiful pastoral views. Separate outside guest cabana. 8 car garage with circular driveway and generous parking spots onsite as well as on street for those special events. Crestron Smart House system. 8 bedrooms, 11 bathrooms. Huge lap pool with spa, outside fire-pit and cascading serene waterfall. All bedrooms are en-suite, with spacious walk in closets and gorgeous baths. All entertaining rooms open to the grand backyard- equipped with BBQ,bar, fire pit and great seating spots. The master suite is like the finest A rated hotel with a closet right out of a boutique clothier, his and hers closets,steam shower and a gorgeous private patio overlooking the magnificent grounds.The entertaining level has a wonderful open kitchen with all the amenities for great cooking.Adjacent to this are several rooms that can be formally or informally furnished for fine dining or that casual California lifestyle. And if that is not enough-there is also a room with a great bar that can be used as a video room or formal living area." 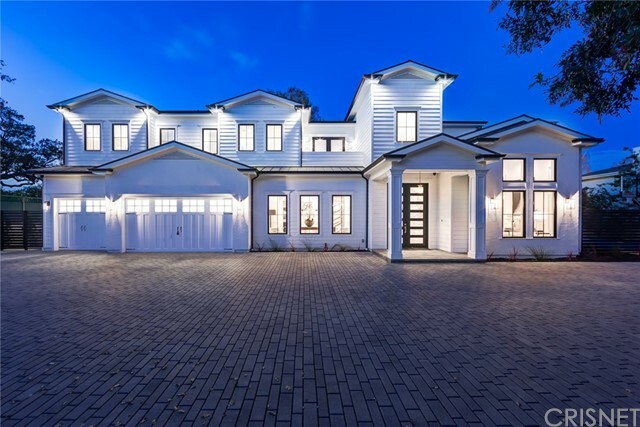 "Exquisitely built Hampton Style New Construction Estate located in the sought after exclusive Royal Oaks celebrity/entertainer enclave of Encino. This elegant and rustic 10,200 sqft sprawling estate sits on an acre of land with gated, private, and beautifully landscaped frontage. Upon entry into the grand foyer, your eyes are immediately drawn to the details - open floor plan and soaring ceilings, white oak floors, designer light fixtures, custom crafted stone wall with glass enclosed wine cellar, and large picturesque sliding doors overlooking the backside of this estate. 8 bedrooms, 10 bathrooms each with their own unique vibe. Walk into the state of the art kitchen with two large stone islands, high end appliances, abundance of white custom cabinetry, and butlers & walk in pantries. Walk upstairs into the spacious loft area with a large patio overlooking the pool. Master retreat is beautifully layed out with a linear fireplace for both the bedroom and the spa like bathroom - vaulted ceilings, massive steam shower, soaking tub, his and her closets, and a private balcony all come together to create a true resort like feel. 1000 sqft patio was built for entertaining with a built in bbq, fireplace, lounge area, 300 sqft cabana, and a zero edge infinity pool and spa complete with 12 ft black stone waterfall flows from the pool and drops into the second level of the backyard, where you ll find a putting green, basketball court, and entry into the 1200 sqft guest house." "Truly spectacular gated new construction South of the Blvd provides the ultimate luxury. The wide entry hallway with ultra high ceilings and checkered marble tile welcome you to the dazzling dining room with brass built-in cabinets and a formal living room with marble fireplace and a private patio. European oak wood floors guide you to the sophisticated family room with marble slab fireplace and wooden built-ins. Across is the awe inspiring kitchen with two beautiful islands, designer WOLF and SUB ZERO appliances, breakfast nook and all conveniences for the gourmet chef. A guest en-suite, custom designed media room, and downstairs 1 out of 2 laundry rooms complete the first floor. Take the marble staircase up to the opulent master bedroom with marble fireplace, custom built-ins and wine cooler. This unique design has 2 separate master bathrooms and 2 walk-in closets on opposite sides of the suite. Both have spa-like marble tiled bathroom, steam shower and a soaking tub in one. The upstairs 2nd laundry room and 3 other en-suites with walk-in closets complete the 2nd floor. The back yard is exquisite with Thasos marble patio and deck, large pool and oversized spa, outdoor kitchen with marble counter, back splash and bar counter. Behind the spa there s a fire pit with built-in seating. A real treat is the 1,580 sq. ft 2 bedroom and 1 bathroom pool house with open floor plan family room and kitchenette. This stunner is close to Ventura, shops, dining and more." 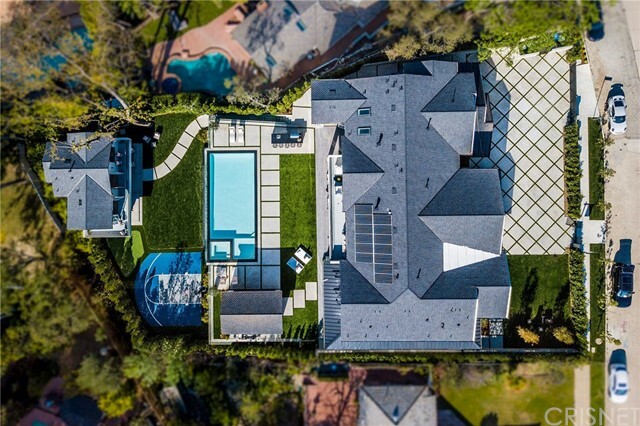 "Sophisticated Cape Cod Contemporary New construction estate located in prestigious South-of-Blvd Encino neighborhood. Tastefully completed w/exquisite designer touches, finishes & fixtures. Over 10000+ sqft on 2 well-planned levels, sits on huge half acre+ lot. Conceived & designed for entertaining. Welcome family & guests into a gorgeous foyer w/ soaring cathedral ceilings, seamlessly move thru grand living areas that have direct access to serene backyard w/swimmers pool/spa, outdoor kitchen, dining & two-story fully equipped guest house. The Main level features home theater, Climate-controlled glass enclosed wine storage w/adjacent tasting room, inviting dining rm & formal living space Sprawling Chef's kitchen features dual counter spaces, high end appliances, custom cabinetry, breakfast nook, family rm & bar. Upstairs features kid's game space, 3 huge bedrooms & 2nd laundry rm. Escape to Master Suite with vaulted ceilings, fireplace, sitting area, lavish bathroom & walk-in clos"
"Nestled behind private gates & lavish driveway on over 1.6 Acres, prime Encino South of the Boulevard location, stunning Mediterranean villa offers a private oasis filled with an artful blend of European styles & luxurious amenities. Nearly 10,000Sqf of living space, 2 story home is the ultimate indulgence in luxury & opulence. Grand formal entry with soaring ceilings, elegant double staircase & inlaid mosaic floor. Gourmet kitchen with custom cabinetry and brand new appliances. Grand master suite with sitting area that opens to private balcony. Master bath with jet tub & his/hers vanities. secondary bedrooms, each with own bath. Library/study with fireplace. Formal dining room, media room, game room, separate family room, climate controlled wine room. Private lavish grounds include an inviting pool, spa and water features, large grassy area and outdoor living room with room with with fireplace, built in BBQ and kitchen area & patios epitomizing the indoor outdoor California living." "Sprawling majestic estate uniquely situated on over an acre with breathtaking views of the San Gabriel Mountains and city lights. This magnificent custom built property evokes a one-of-a-kind lifestyle for someone seeking privacy, tranquility, and convenient access to both the Westside and San Fernando Valley. Elegant 3-story villa (with elevator) boasts seven bedrooms, nine bathrooms, grand living room with soaring ceilings, library/study, media room with wet bar, bonus room ideal for a music studio and/or home office, wine tasting room, gym, and sauna. All of this, nestled within park-like grounds complete with a newly surfaced swimming pool and spa, an exclusive and lighted tennis court with stunning views, and a romantic setting to enjoy dramatic sunsets and dazzling city lights. Parking includes a 3-car attached garage, with room for 7+ in the driveway. Undeniably, one of the most prized properties in Encino!" "Welcome home to your custom built, modern new construction home in the prestigious Amestoy Estates in Encino. Completed in January of 2019, this exquisite home is perched on a lot over 20,250 square feet, with a basketball court, oversized pool, pool cabana with full bathroom, outdoor seating area with a fireplace, herb garden and a full outdoor kitchen. Upon entry, you will be amazed at the expansive view from all angles of your approximately 8,200 square foot home. 5301 Amestoy offers a plethora of amenities including a temperature controlled 300+ bottle wine cellar, 5 fireplaces, an approximately 2,200 square foot basement with an 8 person dry sauna, gym, theater room, panic room, full bar and living area, full bathroom, and bedroom with ensuite bathroom. On the main level you have three separate living areas with a massive custom kitchen and butler's pantry with prep space, as well as a guest bedroom and bathroom with two powder rooms and a large home office. Upstairs, take in the view of the treetops while sitting in your built-in library looking through the floor to ceiling windows. There's room for the entire family on the second floor, with four bedrooms, all with ensuite bathrooms. No stone was left unturned in this luxury new construction home." "Private and gated, this Paul Williams traditional sits on nearly an acre in coveted Royal Oaks. From the moment of entry, the architect's genius is revealed, as inspiring interiors are thoughtfully integrated with beautiful and vast grounds. French doors from the formal entry, formal dining and formal living all open to a central patio conducive to magical entertaining and easy enjoyment of the outdoor kitchen, sprawling grass, large swimmer's pool, and an apx. 1000 s.f. fully equipped, two-bedroom guest house. Main house features include a large center island kitchen with breakfast area, family/media room, powder room, main floor master bedroom suite with a spacious bath and dual walk-in closets, and a second-floor family room. The floor plan is completed with a maid's room/office and laundry room adjacent to the kitchen and 3 car garage. Recently remodeled, modern amenities fit seamlessly into this very special environment so very rich in architectural history and appeal." "NEW PRICE! Remarkable value for exquisite gated compound south of the boulevard in Encino! The circular motor court w/water fountain leads to the 4-car garage & lush grounds. Fall in love the moment you enter thru the wrought iron & glass doors into the grand foyer w/sweeping staircase & high ceilings. Sophisticated formal dining, family room with built-ins, wet bar and indulgent gourmet kitchen with granite counters, stainless steel appliances and center island. Delight friends and family in the opulent movie theater. Relax in the spacious master suite with expansive balcony overlooking the pool, patio, loggia, and boasts a double-sided fireplace with built-ins, sumptuous ensuite bath, and walk-in closet. Resort-style terrace with built-in BBQ for al fresco dining with pool & spa. Additional features include office, gym, game room, sports court, security system and more! An enchanting estate unlike any other, this home is one to relish." "Sensational new construction cape cod with a modern flair is tucked behind a gated flag lot in the coveted Amestoy Estates. Past the paved driveway behind the majestic oak tree, there s space for over 15 cars. Upon entry, pendant lights hanging from the high ceilings and wide plank European floors invite you to the large formal dining room, accented by the impressive wine room wrapped in glass. An elegant formal living room showcases a fireplace and industrial chandelier. The stunning family room has built-in shelves and a classic fireplace. The Gourmet Chef s kitchen is designed with every convenience with Thermador and Miele appliances. The first floor is complete with an office, a state of the art media room, and a luxurious en suite. Upstairs, a wide hallway leads you to a den, 4 en suites and a laundry room. The master bedroom features vaulted ceilings, fireplace and a large deck overlooking the back yard. Walk in closet and vanity lead you to the spa-like bathroom with large steam shower and soaking tub. Outside, resort-like back yard offers a zero edge pool, spa, enclosed pool cabana and bathroom, a 2nd covered pool cabana with fireplace, putting green, sport court, outdoor kitchen and a fire pit. Off the pool spans a bar counter and a fire pit next to the covered patio perfect for al fresco dining. Additional conveniences include a 3 car garage, Smart home with Control 4 System and security cameras. Walking distance to Ventura and Encino Commons." "This gleaming estate showcases a magnificent display of modern sophistication paired with impeccable design. Enter through the gate to be welcomed by a bright and radiant open floor plan, filled with an abundance of natural light, high ceilings, and oversized electric sliding doors that allow seamless entry and exit to the backyard. This stately property boasts five en-suite bedrooms, all of which have a private balcony and walk-in closets, six bathrooms, a movie theater, fitness room, office, and spacious loft with balcony access. The right wing of the home encompasses the dining area and italian kitchen that offers calcutta quartz counters, breakfast area, wine wall, and a remarkable view of the resort style backyard - a perfect compliment to your morning coffee. Make your way to the upper level that encompasses the master suite and four en-suite bedrooms. The master bedroom boasts two walk-in closets, vanity, and a spa-like bathroom that exudes the finest finishes. The entertainer s backyard is built for the LA lifestyle, offering a luminous pool & Jacuzzi, two covered sitting areas, built in BBQ with a refrigerator and counter seating, and an abundance of space for your pets to enjoy the summer. Located near the prestigious Lanai Elementary school, this brilliant home is your family s new paradise." "Located in the heart of Amestoy Estates, this new construction traditional estate sits on a large corner lot and is nestled on a cul-de-sac block. This estate features a grand entrance with top of the line finishes, a private basketball court, state of the art movie theater, full spa with steam and sauna & underground pool, and 6 spacious bedrooms. Walk into an open floor plan with impeccable design detail, curved staircase, large glass windows, butler's pantry, and wine cellar. The dual island kitchen includes quartz counters, Wolf appliances, sub-zero fridge, and built-in espresso machine. Pocket doors connect the living room to the backyard which houses a large pool, BBQ, fire-pit, and private cabana. This is a rare product for this area inclusive of all you can think of finishes. This home has impressive curb appeal and privacy." "Incredible 4 year new estate set behind gates on rare apx 1/2 acre lot in prime SOB Encino. This estate exudes the custom quality & fine finishes missing from much of today's newer construction homes. Apx 7,100 sq ft of ideal floor plan that is highly upgraded featuring formal LR & DRs w/built-in wine cooler wall, butler's pantry, office & guest ste wing currently used as a gym. Addit'l guest ste w/sep entrance is also off the kit/FR area. The center isle kit w/BK bar & breakfast area has SS Viking appls & opens to a spacious FR w/frpl accessing an outdoor covered liv/dining area, BBQ center & the expansive pvt grounds w/grass yrd, resort-style pool/spa, fire pit & cabana bath/changing rm. The upstairs wing has 3 family sts, media/game rm & spectacular master ste w/2 walk-in closets & sep off/gym area. The spa-style bath w/oversized steam shower & soaking tub overlooks the ultra-pvt backyard. Truly a wonderful property that compares favorably with much more expensive homes in the area." 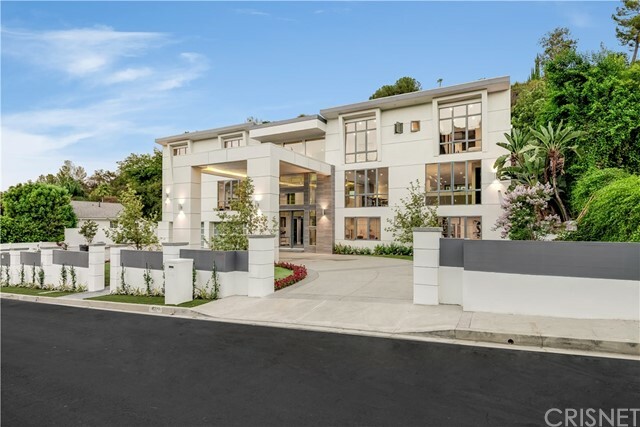 "An exceptional contemporary gated compound So. of Ventura Blvd in prime Encino w/6 en-suite bedrooms, 7 bathroom & appx 7,736 sq ft of living space. Beautiful stainless steel door opens to an expansive open floor plan with 10-14ft ceilings, massive living room, adjacent state-of-the-art soundproof theatre room, & gourmet kitchen w/breakfast area. Caesarstone countertops, waterfall island, built-in Miele stainless steel appliances, & contemporary cabinetry. Sleek & modern design with the finest in high-end finishes including porcelain floors imported from Spain, 4 fireplaces, Sonos sound system throughout, heated floors, & recessed LED lighting. Among the multiple outdoor spaces you'll find a putting green, guest house/gym w/full bath & custom resort-style pool & spa complete w/fiber optic waterfall & underwater speakers as well as a Zen- garden & koi pond w/filtration system. With a 3-car garage & additional parking for 6-8 more cars in driveway there isn't much more you can ask for!" "Exquisitely designed Modern Farm House located in the coveted Encino Hills with panoramic views. This newly built 7,240 SqFt masterpiece was designed with the latest high-end finishes and contemporary features to satisfy the most sophisticated buyers. Features include, 5 en-suite bedrooms, a separate large office, a total of 7 baths, and a 478 SqFt pool house. Control 4 home automation system, pocket-doors, a hi-tech media room, central vacuum, living room with an elegant fireplace, a formal dining, a temperature-controlled wine room, and a butlers pantry. The astonishing chefs kitchen is over the top with 2 large islands, a breakfast nook, 2 sinks & 2 dishwashers, Wolf cooktop & Built-in double ovens, Sub-Zero Fridge & Freezer columns, and a large walk-in pantry. The Luxurious Master Suite has 2 pocket doors and a wraparound balcony perfect for relaxing and enjoying the breathtaking canyon views while cozying up to the fireplace. The room includes a fireplace, custom bar, couples separate walk-in closets, an elegant master bath with a free standing tub and a huge shower. The other bedrooms are just as impressive with their own unique design, character, and touch. The Entertainers backyard invites you to an infinity pool, potting green, BBQ area equipped with Lynx appliances, outdoor fireplace, and a hilltop gazebo for relaxing and enjoying the view. A magnificent paradise for entertaining located within the award winning Lanai school district." "Grand Tuscan Villa located on a corner lot in Amestoy Estates! 16ft wrought iron double doors lead you into this custom masterpiece equipped with high ceilings, two staircases, elevator, 500 gallon fresh water fish tank, two wet bars, living room with wet bar and fireplace, family room off of kitchen with huge wet bar and fireplace and French doors, second floor movie theater, multiple water features, chefs kitchen with huge island that can seat 9 people, breakfast nook, 7 fireplaces, & covered patios and balconies. 1 bedroom suite is located on the first floor and 4 more suites upstairs including the 2,300 square foot master that has a private balcony, wet bar, sitting area, fireplace, spa tub, over-sized shower, and walk-in closet. The backyard offers a pool and spa with grotto and waterfall, covered patio, outdoor dining, BBQ with granite counters, sink, and refrigerator, and a beautiful waterfall that lines the back wall and fireplace." "Built in 2017, this inspiring never-lived-in traditional estate was purchased by the current owner whose vision took a wonderful blue-print and elevated the comfort and aesthetic, infusing hundreds of thousands of dollars to create a one-of-a-kind environment. Designer fixtures and window-treatments can be seen throughout this now decor-perfect home, which includes a large double-island fully-equipped kitchen open to the family room with a wall of disappearing exterior doors, for indoor/outdoor living. The home theatre will be a favored spot, rich in inviting details for the ideal viewing experience. Escape to the master suite, with a fireplace, balcony, fine custom, enclosed closets, and an unparalleled lavish master bath. Outdoors find lush landscape, a pool and spa, detached cabana, welcoming patios and complete privacy, all on coveted Hayvenhurst Drive, a quiet tree-line street in the Encino foothills, close to Lanai Road Elementary and easy Westside access." "Masterful new private gated three-home community, Harper Way harkens back to a simpler time. Close to coveted Lanai Elementary and houses of worship with easy access to the Westside and freeways, yet right in the heartbeat of all that Encino has to offer. Renowned developer Gaskin Design applied their trademark style of comfort and class to the classic floor plan. La Cantina folding doors reveal a luxuriously large flat grassy yard and large swimming pool. Generous setbacks with expansive front yards allow one to enjoy the wonderful green belt scenery and secluded views. Exquisite craftsmanship, exciting details, and exhilarating amenities such as movie theater, wine cellar, bespoke wall coverings, and lighting fixtures. The secondary bedrooms are spacious, and the master suite bathroom, shower, and walk-in closet are huge." "A beautiful Country English estate with lots of privacy, breathtaking views and style - the Holy Trinity of Real Estate. Rarely can a buyer find everything they want in one home. Discreetly tucked behind tall gates and high hedges, but opening up to an expansive and welcoming front yard and entry, the classic Tudor home befits royalty. Impressive scale with exquisite woodwork and craftsmanship. Reminiscent of famous cinematic history showcasing opulence and power, the architecture and flooplan of the public spaces is very different than all of today's spec houses. In addition to a sumptuous Master Suite with a closet that feels like a boutique on Montana Avenue, the remodeled bathroom offers glorious views of the Valley below.The sparkling swimmer's pool and deck enjoy fantastic club-worthy sound system, and a huge basketball court down below." "Spectacular Trophy New Construction home in prime Encino AMESTOY ESTATES on a beautiful Cul-De-Sac Street. Quality and attention to detail is an understatment, high ceilings and open floor plan through-out. Expansive entertaining spaces including a dramatic living room with wood beams and oversized formal dining room. Gorgeous gourmet kitchen with top of the line Sub Zero and Wolf appliances opens to family room and grounds beyond. European white oak floors throughout. Luxurious Master suite with soaring ceilings and a stunning bath. State of the art media room w/ 110 , 3 car garage, your private wine cellar. Control4 Smart Home Automation. Gorgeous private yard with a SPORTS COURT and a sparkling pool/spa and outdoor pool house with a separate bathroom and plenty of sitting for your guests. This is a MUST SEE!!!"